Kevin C. Hill, Esq. – 100 Black Men of America, Inc.
Kevin C. Hill, currently serves as Assistant City Attorney for the City of New Orleans where he is legal counsel to the city’s Finance and Treasury Departments. In his immediate past, Kevin served as an Assistant Attorney General for the Louisiana Department of Justice, where he was Deputy Chief of the New Orleans Office. In this capacity, he was litigation counsel to the Mercedes Benz Superdome, the Smoothie King Arena, the Louisiana Department of Transportation and Development, and the Louisiana Department of Education. Earlier in his legal career, Kevin was Senior Counsel in the law firm of Usry, Weeks, and Matthews, LLC, where he handled several class action matters, most notably, the nationwide Fen Phen Diet Drug Litigation which resulted in a multi-million dollar settlement. Kevin was the managing partner in his own firm, Carter, Martin, & Hill, a New Orleans firm that handled a variety of complex civil and criminal matters. Born in Mississippi and raised in New Orleans, Kevin is a graduate of Xavier University of Louisiana with a Bachelor of Arts degree in Political Science and a Juris Doctorate from the Southern University Law Center in Baton Rouge, Louisiana.Kevin has been a member of 100 Black Men of Metro New Orleans, Inc. since 2000 and has served in every capacity of leadership in the chapter, including having served as chapter president for two terms, the last of which he was host president of the 27th National Conference. Additionally, he has served as General Counsel to the chapter for 15 years. 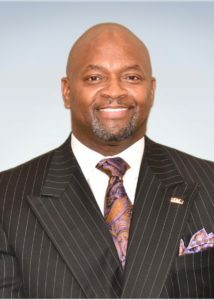 He is an immediate past Member At Large and Chaplain on the Board of Directors for 100 Black Men of America, Inc. Currently he serves on the Board as Chaplain and Chairman of the Partner Relations Committee and is a member of the Governance Committee. He is a member of the Louisiana Bar Association, the New Orleans Bar Association the Louis Martinet Legal Society of New Orleans, and is a member of Kappa Alpha Psi Fraternity, Inc. In his most important roles ever, husband and father, Kevin lives in Hammond, Louisiana with his wife, Dwan Mabry Hill, M.D. and his two sons, Karlton, a junior at Xavier University of Louisiana and Chandler an 8th grade student at Southeastern Louisiana University Laboratory School. He is a licensed and ordained Elder and serves as 1st Assistant Pastor of God’s Faith Ministry of Amite, Louisiana where his father is Senior Pastor.